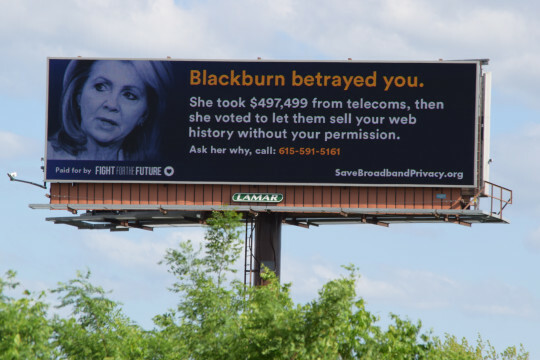 Today Internet activists unleashed billboards in the districts of lawmakers who take large contributions from the telecom industry and voted in March to slash Internet privacy protections, allowing Internet Service Providers (ISPs) like Comcast, AT&T, and Verizon to collect and sell their customer’s personal information without permission. The billboards were organized by Fight for the Future, a leading anti-censorship and digital rights organization, and paid for through hundreds of small donations collected through a crowdfunding page. Fight for the Future was instrumental in the massive grassroots campaign that successfully pushed the Federal Communications Commission (FCC) to enact the strongest net neutrality protections in US. history last year. They built the page BattleForTheNet.com, which was responsible for more than ¼ of all the net neutrality comments received by the FCC during its feedback process, and were behind the Internet Slowdown protest, which was supported by more than 40,000 websites including some of the largest on the Web like Kickstarter, Etsy, Netflix, and Tumblr. The group also helped take the fight for net neutrality into the streets with creative protest campaigns like Occupy the FCC and the nationwide Internet Emergency protests.